2. Add the cornflour, vanilla and vinegar, then mix until combined. Draw a 20cm circle in the middle of a large sheet of baking parchment (use a cake tin as a guide) and lay on a large baking sheet. Spoon large mounds of the meringue to fill the circle in a single layer, and then spoon more meringue on top, creating a slight indent in the middle. 3. Put in the oven, immediately reducing the temperature to 100°C, gas mark ¼, and bake for 1 hour 45 minutes. 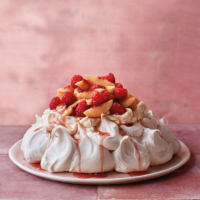 Turn off the oven and leave the pavlova inside to cool for 1 hour. Then leave the door ajar with the pavlova inside until completely cool (or overnight). 4. Meanwhile, for the nectarines, tip the sugar, wine, lemon zest and juice, vanilla pod and 200ml water into a deep pan. Bring slowly to the boil to dissolve and cook until reduced to about 250ml. Taste and add a little lemon juice to sharpen if needed. Set aside to cool. 5. Cut a small cross through the skin on the underside of each nectarine or peach. Put in a large bowl and cover with boiling water. Leave for 30-60 seconds, then rinse under cold water and carefully peel off the skins. Slice the nectarines and stir into the rosé syrup; leave to infuse for 1 hour. Add the raspberries and leave for another 30 minutes. 6. Whisk the cream, icing sugar and vanilla paste to soft, floppy peaks, then spoon into the middle of the pavlova. Using a slotted spoon, lift the fruit from the syrup and arrange on top of the cream. Drizzle the syrup over the top and serve.